Julian Brandt put on a virtuoso display as Bayer 04 Leverkusen gave their hopes of a top-four finish a timely boost with victory over VfB Stuttgart on Sunday. Despite contesting their tenth game of a jam-packed four-week schedule in all competitions, Leverkusen looked fresh at the Mercedes-Benz Arena. Javier 'Chicharito' Hernandez headed over from Christoph Kramer and Karim Bellarabi made Stuttgart goalkeeper Przemyslaw Tyton work, before Brandt found a yard of space in the box to sweep home the opening goal with just 11 minutes on the clock. Stuttgart had their moments as an attacking unit, but were ultimately indebted to Tyton for keeping the half-time scoreline respectable. 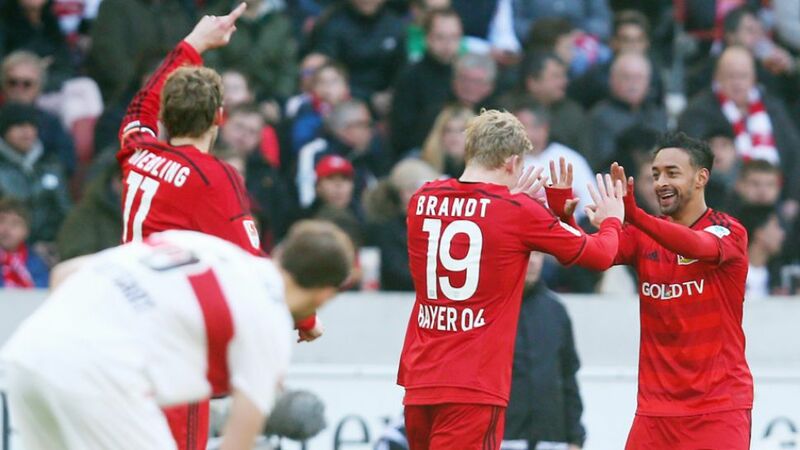 Leverkusen doubled up shortly after the restart, however, with the sprightly Brandt the provider. The 19-year-old midfielder powered forward and found Bellarabi, who drove low and hard into the bottom corner to add to his earlier assist. Stuttgart’s goal was leading a charmed existence as Brandt and Vladlen Yurchenko were denied by the woodwork in the space of eight exhilarating minutes. Brandt went off to a standing ovation from the travelling fans late on, but not before going within a strong Tyton save of his second goal of the afternoon. This really was quite the performance from young Brandt, who had a direct hand in two goals in a single Bundesliga match for the first time in his career. Leverkusen were knocked out of the UEFA Europa League in midweek, but dropped points for Borussia Mönchengladbach and 1. FSV Mainz 05 on Matchday 27 mean Die Werkself have every chance of playing continental football again next term. Victory over Stuttgart takes them up to sixth - only two points behind fourth-placed FC Schalke 04. Leverkusen scored their earliest goal of the season and first in the opening 15 minutes of a match.Stuttgart conceded in the opening quarter-hour for the first time under coach Jürgen Kramny.Leverkusen duo Benjamin Henrichs and Yurchenko were handed their first Bundesliga starts.